Combine decorative interests with functional consideration for perfect kitchen lighting. 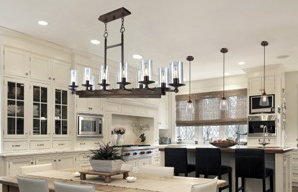 A popular decorative trend in kitchen lighting, is the use of shaded chandeliers above an island. The shades provide glare control and reflect light down to where it is needed. Rustic: Natural materials with a national park meets Central Park flair. New Classic: Timeless and simple – elegant without being overly ornate. Industrial: Back to basics with simplicity and a well-made utilitarian feel. Geometric: Unique shapes and myriad designs add dimension and drama. Glamorous: Luxurious materials and a little sparkle (or a lot) turn spaces from boring to bold. Schoolhouse Globes: Old can be new again, whether it’s restored vintage or new with nostalgic design. See the newest home and lighting products at an Hortons Home Lighting showroom. Pendants continue to be popular in kitchens. They are available in a seemingly infinite array of shapes, styles and materials, making them a great way to create a unique look for your kitchen. For optimum functionality and aesthetic appeal, pendants should be placed no lower than 28 inches above a kitchen island. Pendant spacing will vary depending on the size of the island and the pendants, making it difficult to define an exact recommendation for how far apart to place them. However, if you have small pendants, place them in groups of three. With larger pendants, a pair will work best. One interesting trend in pendants is to use historic lantern styles in the kitchen. Let a professionally trained expert help you find the perfect fixtures to define and light your home. If you don’t already have a copy of Lighting magazine, just click for a free copy. Lighting magazine is the best go-to resource for home lighting and design inspiration. In it, you will find beautiful pictures of before-and-after room transformations that show how lighting can completely give your home a whole new look. The magazine also includes many design tips and easy-to-do lighting enhancements. For example, if the lights in your dining room are too bright, it will distract from your presentation. For an easy fix, simply reduce the lumens in each bulb for a reduced cumulative light effect and a more pleasant dining experience. Pick up your free copy of Lighting magazine at an Hortons Home Lighting showroom.